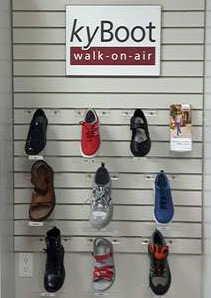 Introducing a shoe that allows you to walk with the support of a patented technology of an air-cushion sole! Open the door to the possibility of a pain-free life with kybun shoes! These revolutionary shoes are changing people’s lives daily and we are proud to be the only therapeutic shoe clinic in Canada offering them. You can start learning all about them by clicking here and you can follow our educational kybun shoe page on Facebook! After surviving working the front desk this past summer, I am happy to report I have a new assistant to help Bonnie keep me organized. Louise will work on Wednesdays and Thursdays. My hours willremain the same (except for stat holiday Monday November 13th and 2 days away November 22 and 23rd). No big plans for the holidays, except a week at Christmas off (the 25th to January 2nd). Our kyBoot shoes expanded in September! Many people are very excited to walk without pain and have more energy after a long day standing for work! We like to schedule about 30 minutes for a kyBoot experience and besides our regular Tuesday to Thursday mornings, I am looking to open up on Fridays to accommodate all our referrals who want to discover the ‘Joy of Walking On Air’. Please call the office if you or a friend/family member would like to check them out. Soon we will have gift certificates available if you would like to have people contribute towards a kyBoot purchase. The certificates will not be refundable for cash, but are transferable and will not have a name attached to them. We are constantly improving our services and now we can bill third party insurance companies directly through Telus e-plan when we have your insurance information. This means your insurance portion is billed to us and you will know immediately what your coverage allows. Last but not least – In the next few months, I may have visiting practitioners who will be observing my treatments or providing additional services on certain days. I am hopeful to attract colleagues who are interested in learning Micro Analysis and eventually Micro Alignment techniques to take care of more people! As a Doctor of Chiropractic with a background in Environmental Health, I am very aware of how sensitive our bodies are to environmental stress. Chemical pollutants in the air we breathe, the water we drink, and the food we eat can create an inflammation response. This is largely due to body acidity, a component of virtually every health challenge we have, from infectious diseases and allergies, to muscle and joint injuries. All health conditions ending with “itis”, such as “arthritis”, sinusitis” and “gastritis” refer to inflammation of the involved tissues. Being in a state of acidity when you are injured or sick can cause more inflammation and slow down your recovery. It is important to be proactive about your health. Do you ever get frustrated by how long it takes you to recover? The natural healthy state of the human body is slightly alkaline. Maintaining an alkaline body is important to help us deal with environmental stress. 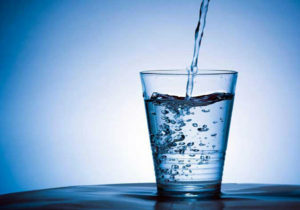 By creating healthier water for drinking, you can improve your health without a great deal of added effort or expense. Enhanced water will quench your thirst, taste better, nourish your cells and alkalize your body pH. Electric ionizers cost $1000 – $4000, need electricity and will need to be replaced someday. I discovered that a bioceramic filter does the same job at a fraction of the cost. It can be used with existing home water treatment systems such as reverse osmosis or carbon filters to revitalize and re-energize drinking water. It fits into your Brita jug, is easy to store and maintains the alkaline pH and antioxidant properties as long as the filter is in contact with the water. It is also handy to travel with or keep at the office for healthy water. I have been drinking this revitalized water for over seven years now. I notice less muscle and joint pain and a stronger immune system. I recommend it to my patients with allergies, arthritis and gastrointestinal stress, in fact, anyone with chronic inflammation or symptoms of acidity. A package of three filters lasts up to one year. You will notice that it improves the taste of all beverages and foods. A normal human body consists of 60 – 70% water. A small investment ($20 for one filter) in enhanced water can have great health returns by boosting your body response to environmental toxicity. Healthy water supports a healthy life! Micro Alignment Therapy is a whole-body chiropractic adjustment technique that can be used on the spine, peripheral joints (such as knees, elbows, ankles, jaw, etc.) and the cranium. Dr. Barbara James has practiced this chiropractic technique exclusively for the past 28 years, having learned it first hand from Dr. Robert Young, the renowned Canadian chiropractor who pioneered the technique more than 40 years ago. Today is World Spine Day and the selected theme is “Your Back in Action”. The focus this year is on the importance of body awareness and activities that promote a healthy spine. We encourage everyone to participate in this global action initiative as part of the Bone and Joint Decade’s Action Week. Here are some statistics you can share with the public about the importance of body awareness and physical activity. 45% of women and 37% of men spend less than 30 minutes a day up on their feet at work. According to the National Health Services, it is recommended to exercise for 150 minutes a week. Older adults, with poor mobility, should perform physical activity to enhance balance and prevent falls on three or more days per week. 86% of Canadians agree that children and youth do not get enough physical activity. Aerobic activity should be performed in bouts of at least a 10 minute duration. More than 50% of people regularly eat lunch at their desk.